Nothing fancy, but clean, inexpensive and well run. submitted by Joshua H. - Sep 18, 2015 |Recommended: YesI actually really enjoyed living here for 2 years. I had a unit on the side of the building facing the Dallas light rail line and that was very annoying the first week or two, but it only became a problem when outside the building while a train went by. Otherwise, I rarely noticed it in the apartment. The location is becoming better and better every year as businesses and other complexes sprout up around it. There is a Mexican market right across the street that is perfect for fresh veggies and meat, plus an awesome little dive bar with a patio for a casual drink in the evening. There is nothing luxurious about the building or finish out in the apartments but they are well maintained and the maintenance staff was extremely efficient. For the area, the rent is reasonable and the rate hike after the promo first year was actually pretty minimal compared to what I've seen from other complexes. If you have 50 extra to spend I would splurge on covered parking because coming home late on a weeknight might leave you with a long hike from the first available parking spot. Great Place to call home submitted by Mianesha B. 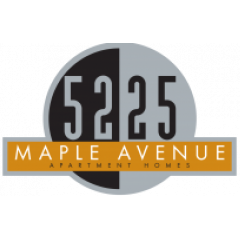 - Sep 01, 2015 |Recommended: Yes5225 Maple Apartments are very laid back and chill. I have been here 2 years and I love it, other then parking everything is awesome. Parking is in a gated area it's just first come so you may have to park further then you would prefer if you get off of work late. Very good for its pricesubmitted by Isara L. - Aug 07, 2015 |Recommended: YesApartments are spacious and well-maintained. The location is very good if you work at UT Southwestern - close to both workplace and entertainment. Also, the neighborhood Maple Avenue is rapidly getting developed. Nice place to livesubmitted by Melanie H. - Aug 01, 2015 |Recommended: YesOverall, I think 5225 Maple is a great place to live. Maintenance is ALWAYS completed work order requests in a timely fashion. I love that there is a courtesy officer on site. Only negatives is that if you do not like noise, do not sign a lease for a unit close to the pool area, because you'll hear your neighbors while they're out there when the temperatures outside are warmer. Layouts are spacious and the concrete floors are a loft style plus Compared to the other apartments located on this street, this apartment is competitively priced and affordable for the changes happening in the neighborhood. The office staff is great They are always professional and respond to any requests in such a timely matter usually quicker than expected There are never any pests issues and the landscaping is always nice and manicured. Convenient location with everything needed submitted by Jeanine B. - Jul 08, 2015 |Recommended: YesI worked at UT and looked for a place close by. The location was great, and the apartment and apartment building offered everything I needed. Spacious apartment with a great closest, pool, plenty of parking, and low noise levels. Neighbors can be noisy, but a great place to live.submitted by Domonique G. - Jun 25, 2015 |Recommended: YesNeighbors can be noisy when walking through the halls. Neighbor above has a huge dog that is extremely loud at times. Otherwise I enjoy living here. Great deal submitted by Kristen L. - May 01, 2015 |Recommended: YesI lived here for two years and it was the best property in the area for the best price. The staff and maintenance were extremely friendly and always addressed any concerns quickly and effectively. Great location, staff, and maintenancesubmitted by Nathan - Feb 01, 2015 |Recommended: YesI ve lived in various complexes around the metroplex and really like 5225. The staff has been friendly since day 1 Christina is very nice and helpful . Seems to always be clean and good parking. Maintenance is very quick and good fixed an AC issue that another apartment could never figure out . The hallways are concrete so echo easily so all the dogs often bark and talk to each other, but thats about the only negative thing, but the dogs never bark long at all. I love the modern look of everything. Convenient and great locationsubmitted by Ana L. - Jan 19, 2015 |Recommended: YesThey are very nice and the maintenance response is very quick! response from property - Apr 15, 2015 Ana Lidia, Thank you for your review! It was a pleasure having you here. Good luck and we hope to see you again. Love it!submitted by Domonique G. - May 02, 2014 |Recommended: YesEverything is a breeze. Parking, facilities are well kept, staff is sweet and helpful no complaints. Lived here for 5 months now. Oh and the gym is great too!!!! Its nice and feels safe.submitted by Manu S. - Feb 19, 2014 |Recommended: Yesits a great complex with lot of great amenities. staff is very friendly and always willing to help out residents. been here for two years and its been a pleasent experience.